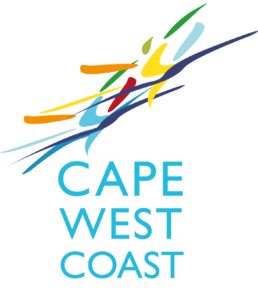 Region info of the Cape West Coast. Every country in the world has a West Coast but only South Africa has a WESKUS, which lies within the Western Cape Province and has 5 extremely diverse regions within its borders. The colour coding shown here is used throughout this guide to place the towns (which are listed alphabetically), within the different regions. These different regions each have their own unique attractions which include the beautiful, and at times desolate, coast with its magnificent lagoons, and numerous small fishing villages, stretching from Bokbaai in the south to Brand-se-Baai in the north; the arid beauty of the Knersvlakte and the vineyards along the Olifantsrivier in the Namaqua West Coast – Matzikama region; Citrus- and rooibos farms, magnificent mountains with spectacular rock formations and rock paintings in the Cederberg; Bokkomlaan, a birding paradise and extreme adventure activities in the Bergrivier region; five million year old fossils, a Ramsar site and exciting water sport in the West Coast Peninsula – Saldanha Bay area; and the high quality grain-, olive- and wine farms of the Swartland. waders, seabirds and birds of prey. Sipping soetes, chewing on a bokkom and watching the locals dance “die Riel”, transforms any visitor into a real “Weskusser”.